Catalog recipients purchased 28% more items and spent 28% more money than their non-catalog counterparts, with Direct Mail percentages trailing only slightly behind. The study also noted a revenue lift of 163% for websites supported by catalogs as opposed to those that were not. 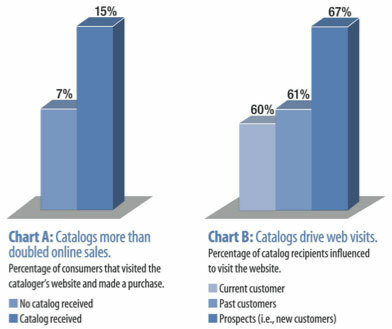 Chart A shows that sending catalogs more than doubled online sales. And catalog-based revenue was also over two times greater than revenue realized from recipients of only online communications. Clearly, Direct Mail and catalogs are powerful ways to increase online sales. Mail-based communications can also help you control sales fluctuations throughout the year – by scheduling your mailings to promote sales events and offset seasonal slowdowns. While the Internet gives you access to a worldwide customer base, you are also competing in a global arena for those same customers. Catalogs can give you a head start on winning them – even before they log on. Catalogs were found to greatly discourage comparison shopping – by more than 7%. Catalog recipients were significantly more likely to shop for holiday gifts at the website than non-catalog recipients. As Chart B illustrates, catalogs had a large impact on website traffic – especially among prospects. What this means to you: While catalogs are an effective tool for maintaining your relationship with existing customers, they also provide many advantages for helping to build awareness among new customers and introducing them to your website. Almost 60% of online shoppers enjoy receiving catalogs. 57% of online shoppers said that even though they buy online, they still like to have a catalog on hand. 61% of online retail shoppers reported that when they have a catalog while shopping online, they may see additional items they would like to buy. 84% of catalog recipients feel it's easier to shop online with a catalog in hand. The numbers say it all: Catalogs work hard to enhance your customers' online shopping experience and your website sales. Just as with exercise, frequency can have a considerable impact on results. 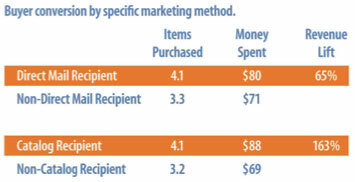 In fact, Direct Mail and catalogs sent within the previous month were shown to have a major effect on shopping behavior. According to the study, 17% of people who received a catalog in the previous month purchased at least one item, compared to only 11% who received a catalog more than a month ago. More satisfied with the company's website. More satisfied with their experience of the company. More likely to recommend the website and the company to others. As this article illustrates, Direct Mail and catalogs can help you drive traffic to your website and boost online revenue. By sending out catalogs and Direct Mail pieces, people go to your site ready to buy and are more likely to return. 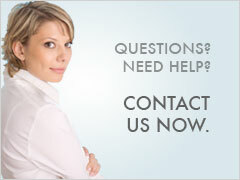 So try marketing your site with mail, and see what this proven media channel can do for your sales.